Getting stuck on the side of the road is no fun – and it can be dangerous. That is why you need a towing service you can trust to get to you quickly and get your vehicle to safety.Don’t let a little car trouble put you at risk. 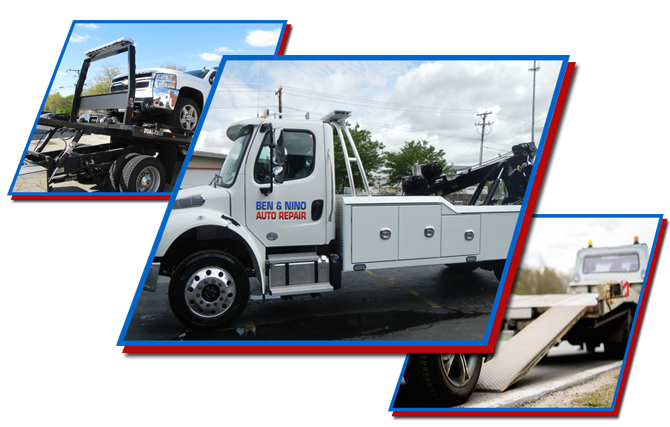 Call Ben and Nino Towing & Auto Repair to come to your rescue. A leader in Marine Park Brooklyn towing, our trained staff can help in almost any situation. You’ll never be left stranded with us on your side – we offer help 24 hours a day, 7 days a week (even holidays). A dead battery can be quickly fixed. Call us for a jump start nay time of the day or night. Running a little low on fuel? Don’t get stuck alone on the streets of Marine Park Brooklyn. Call Ben and Nino’s for quick fuel delivery. Lost your keys (or left them in your car)? No worries. One call to our expert towing crew and they can bring you a new factory key; reprogram your fob; and get you back in your vehicle –and on the road. When your motorcycle breaks down in Marine Park, you need a towing service that can handle this specialty need. Call the professionals at Ben and Nino’s for a quick response. Nothing is more frustrating than a blocked driveway. Whether you are stuck at home, or a vehicle is blocking your commercial driveway, Ben and Nino’s will be there in no time to remove that car or truck and give you the access you need. Is there an old car on your property you need to get rid of? Call the towing specialists at Ben and Nino’s Towing and Auto Repair to take care of the problem for you. When your vehicle breaks down you need help – and you need it fast. The crew at Ben and Nino’s understands that and is ready to come to your rescue any time of the day or not. Call now for information.